On the south side of Bowen Island, BC, there is a special place. It is hard to describe unless you have been there – the otherwise damp coastal rainforest gives way to dry rocky bluffs carved by the ocean and coated with salal. Vancouver Island, Georgia Straight and the Salish Sea await you ahead. The salt air tickles your senses and the expansive vista beckons you forward, but don’t be too hasty, give yourself pause before reaching the edge. 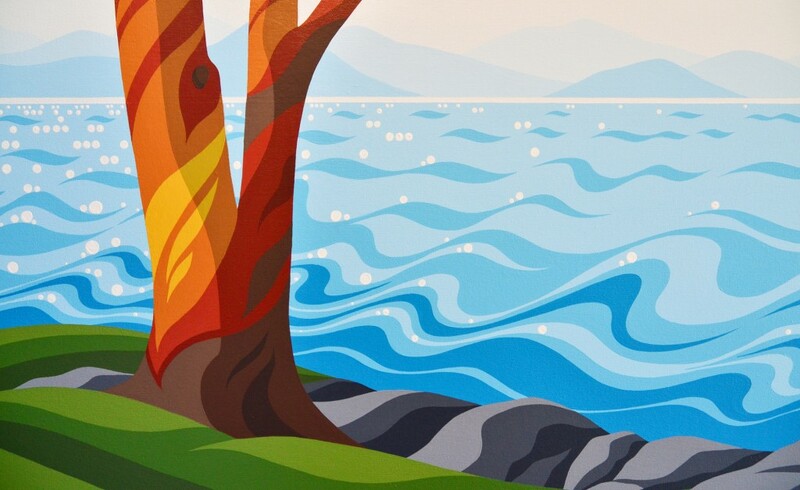 This meeting of worlds – forest and sea – is the home of the iconic Madrone. The Pacific Madrone, Pacific Arbutus or Arbutus menziesii is a species of evergreen tree native to the North American west coast; inhabiting rocky coastal bluffs from British Columbia south to California. Their iconic bark peels into brilliant shades of yellow, yellow-green, orange, red and rusty brown. They can live up to 250 years and when fully mature grow up to 100 feet in height with trunks 5 to 8 feet thick. It is these extremely old, thick trees that helped give inspiration to this piece. 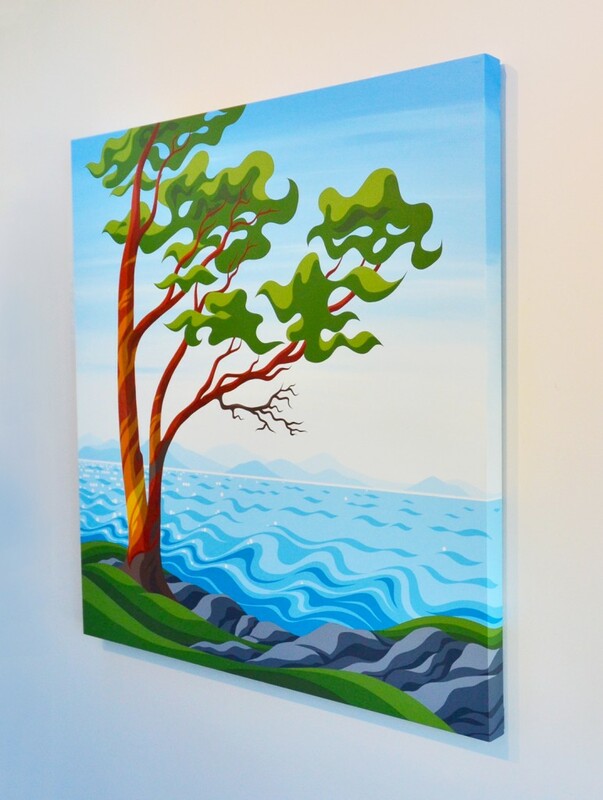 You often see the younger, more twisted trees clinging along the coast but when a tree finds itself in ideal conditions it can grow massive, easily filling up a 36″ canvas. These trees are more rare now but there are a few giants left hidden like treasures around the island. One day not too long ago I ventured to one of my favorite spots at The Cape on Bowen. I happened upon a couple carving their names into the oldest, largest most beautiful Madrone that I know of, the one that was of particular inspiration for this painting. I instantly confronted them and they left but at the time I was too upset to look. Later I found the huge fresh scar carved deep into the delicate skin of this beautiful giant, just one of dozens of ancient marks left by passing people. I knew in that moment I needed to pay my own respect to the tree by highlighting its beauty instead of trying to take it away. 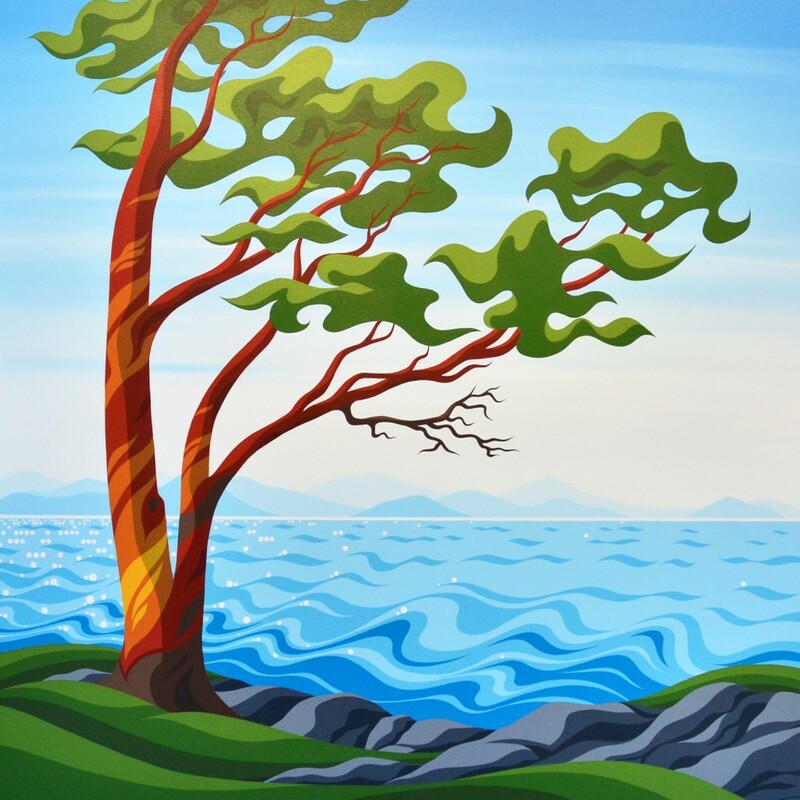 really special, right down to capturing the ever present dead branches that one always finds on mature arbutus… love this image, and all your work.